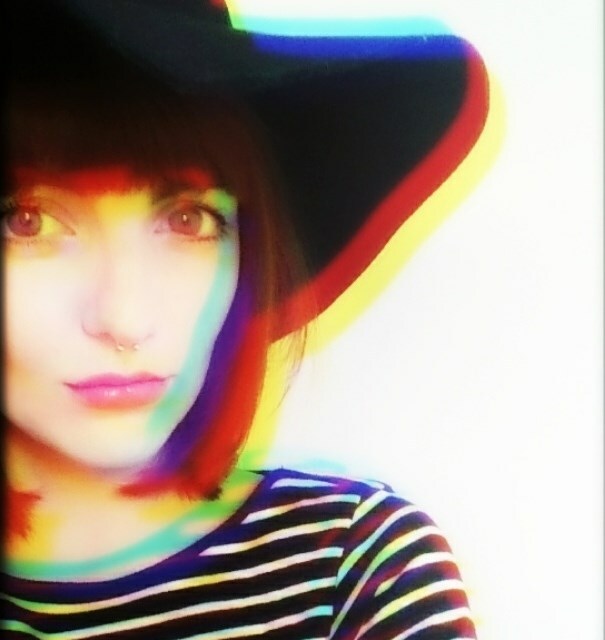 I first found my passion for bargain hunting at university whilst I was studying fashion promotion and styling. Obviously I loved designer fashion but on my student budget there was no way I could ever afford the pieces. I wasn’t really that bothered by the whole ‘ethical’ aspect of it. To me charity shopping meant I could wear outfits that no-one else would be wearing on my fashion course plus it would save me money. Time-hop reminded me that it’s been six years since freshers times! Man, how times flies. I think in first year I wasn’t as keen on charity shopping as I was still a bit on the fence about it, why would I buy old clothes when I was in walking distance to a Primark?! What first year did introduce me to was the flea market. I remember our first project was doing a window campaign for the local charity shops based on a film. I think that pretty much changed my view on styling. Our film was Labyrinth with David Bowie and I just thought it was an amazing project idea. We had to use clothing from our assigned charity shop but we could go wild in the flea market for props and accessories. I used the flea market a lot for future projects but never really for my personal wardrobe til the following year. Our project was the large black and white image on the left, even made it in the local paper! This is when I set up my online vintage shop and again I was still on the vintagevintagevintage mindset. I didn’t see any point in buying high street names. I think I was more of a magpie for old labels and granny-chic knits. Anything bright and psychedelic was on the pile too! Although again I still didn’t wear all of these crazy clothes. I was still trying to find my style. I only had my online shop for a couple of months over summer whilst I was off university. My favourite thing was to trawl the Urban Outfitters website or nip into Topshop and try and find charity shop dupes in a similar patterns or shapes, so that’s when I was more influenced by trends. I was studying upcoming trends on my course and always involved in researching catwalk and street style so I guess that gave me a massive heads up in searching for ‘on-trend’ second-hand pieces. 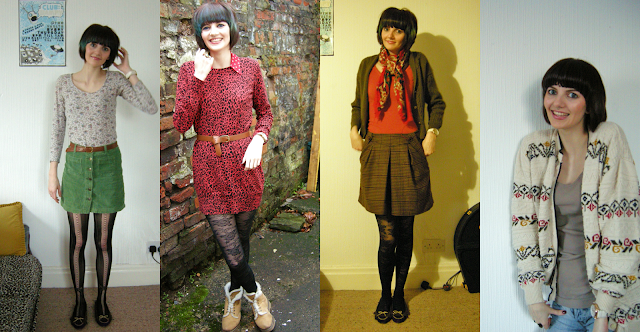 My vintage wardrobe whilst at university. At this point I was becoming more aware of the cost of ‘fast-fashion, trying to become more ethical and I was more interested in sustainable and DIY fashion. Most of the girls in my class were high-street addicts and would gladly spend their student loan on a huge shopping trip. I just couldn’t justify it and I got a buzz from finding second-hand bargains anyway. Fast-forward to me being a graduate, living in Lancaster and commuting to Preston most days for work. I wasn’t full time and the train fares zapped a chunk of my earnings so charity shopping was a necessity. Lancaster has loads of amazing charity shops and I’d visit them at least once a week for my retail therapy. I still wasn’t really sure what my ‘defining style’ was, but I was still steering away from ‘classic pieces’ and ‘basics’. Looking back I was buying things if they were cheap, with no regard if they went with any other pieces on my overflowing, clothes rail which collapsed on a daily basis due to having too many clothes!! I had ‘nothing’ to wear because my wardrobe was lacking simple outfit-building pieces. My uniform was my denim shorts and a jazzy top or if it was cold my denim shorts with tights and a jazzy jumper haha. My actual uniform was head to toe black so I wanted to add as much colour as I could to counteract the daily dose of goth. I started to welcome high-street labels into my wardrobe under a few conditions. - they had to be a natural material such as cotton or wool. This is where I changed to quality. I used to buy vintage as it was better made, but I found that it did deteriorate after a few spins in the washing machine. I also used to buy cheap pieces that needed a lot of Vanish and some stitching and would look better if it was altered etc etc but I found that I just never got round to giving them the TLC they deserved. Honestly I never really spent more than £3 on an item. My autumn edit for the vintage fairs I did a couple of times. I moved to back to Preston, I noticed that my favourite charity shops that used to be brimming with vintage were now full of second-hand Primark and George at ASDA. This is when I attempted to find the best quality high street brands. I don’t buy supermarket/ Primark or Matalan second hand as the materials and styles are very trend-based. I find that Next, Zara, Oasis and Marks and Spencers basics last well and work season to season. In my opinion Topshop & River island are ok for occasional wear, but I wouldn’t expect them to last long. I read somewhere that before you commit to buying a new item of clothing you should vision yourself wearing it at least 30 times for it to be a sustainable purchase. It really got me thinking, I was probably wearing some items 5 times max before they were becoming tatty or losing shape. Now the 30-wear question is always at the front of my mind when I’m shopping. I think this is the case whether you shop on the high-street or second hand. I also take more care of the items I buy, if it’s a delicate material I’ll hand wash them, I’ll repair any holes or loose hems as soon as they happen. I bought proper hangers so clothes don’t lose shape. I polish my shoes regularly and stuff my boots when I’m not wearing them. After watching The True Cost, I’ve learnt that clothing should be loved and treasured. If it doesn’t work for you don’t throw it or hoard it, sell it or give it to someone who will appreciate it. Clothing should make you feel fantastic, finding a bargain should make you feel great too. Although a charity shop bargain will always make you feel 100% better than a Primark bargain. If you’ve not heard of The True Cost, it’s on Netflix and it’s a really insightful documentary about how the fashion industry affects third world countries. The next transition in the second-hand quest was to align it with my new found vegan values, This means no fur (obviously, I was anti-fur anyway) no leather, no suede, no wool, no cashmere and no silk. It's fair enough to say that it's second-hand/vintage so at least you are giving it another lease of life which is less cruel. However for me personally that isn't an option anymore.The new leather the industry makes today will be vintage one day and that doesn't mean the animal didn't suffer. So it's better for my conscience to not buy any. I have a few items in my wardrobe that I've had for years that are made from wool or leather, but I'm aiming to wear them til they can no longer be worn and then replace them with a synthetic alternative. Now I'm living in my caravan back in The Lakes, No-one is really fussed about fashion here so the majority of the time I'm wearing jeans, a tee and my Pikachu slippers! It's nice to get dressed up for a meal or going out with the girls. There aren't as many charity shops close by so I get the train to one of the nearby towns occasionally and make a day of it! Actual civilization! My main priority at the moment is to have a workable wardrobe, where it's simple to choose an outfit and I never say 'I've got nothing to wear!' This means that I've been swayed by basics and plain colours. Obviously I still have a few jazzy patterned key pieces but by adding timeless basics into the mix it means I have more ways of wearing my prints. Loved reading this! I've recently just moved home from Winchester, where I was at uni. The charity shops there were insanely good and I severely miss them now! Like you, I used to look at blogs/high street shops and then find looklikes in charity shops - much cheaper AND you would always have something totally unique! I'm hooked on the idea of that '30 times' wear rule, what a good philosophy! I like true vintage and generally rinse them through in the sink. I'm pretty adept now at scanning the rails in the chazzer shops. We have a caravan near Grange over Sands and I've yet to get my clobber right when we are there. I refuse to look like the rest of the walkers and day trippers while I'm there haha. I love buying things in charity shops that I no way would be able to afford brand new.